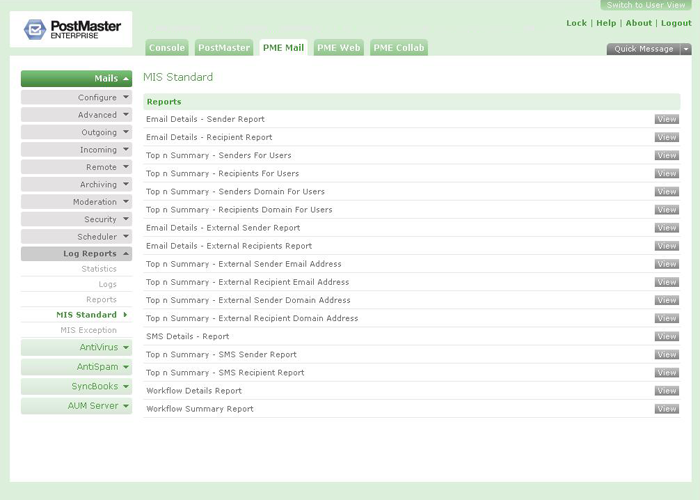 The MIS Module for PostMaster Enterprise Mail (PME-EMIS) & Web (PME-WMIS) provide extended analysis and reporting on the email and Internet usage by users on your network. 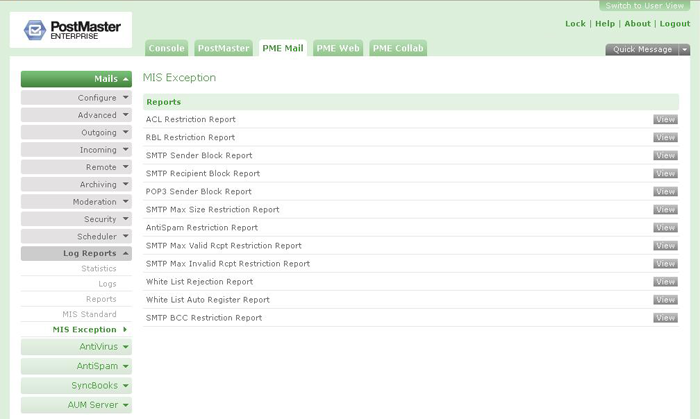 PME-EMIS analyzes email log files and provides detailed reports and analytics on the entire mail-flow to and from your network, allowing you to understand how your users are using the company email-ID provided to them. Similarly PME-WMIS analyzes web-traffic log files and provides you with detailed reports of URLs accessed, and files downloaded by the users within the network. PME-EMIS is a powerful tool for identifying misuse or abuse of organisational email by persons for personal non-work-related use, and the corresponding drop in productivity. Likewise, PME-WMIS helps you track and weed out unproductive Internet access, and analyse file downloads to plug any misuse. The reports have been designed to provide you with clear and actionable information for setting up and maintaining a professional usage and access policy for email and Internet access within your organisation. You will be able to take informed decisions on properly applying restrictions, with tightly targeted permissions, which can then be easily implemented via the wide-range of control mechanisms built into PostMaster Enterprise. As a significant fringe-benefit, the MIS module also ensures that your company bandwidth is used more effectively and productively. The screenshots that follow will show you the range of information that the MIS module provides you to help you ensure that email and Internet access is used productively in your organisation. 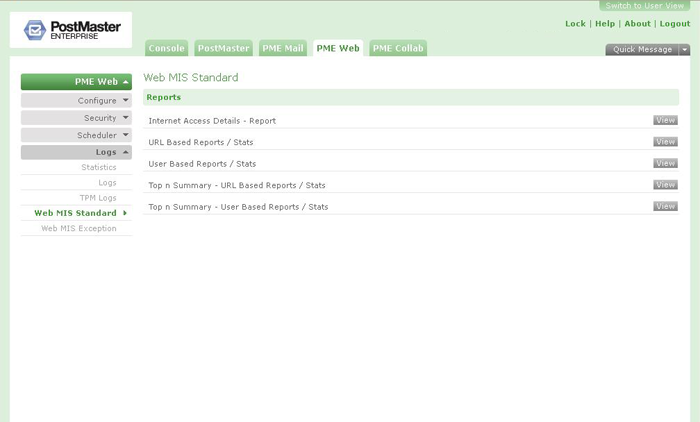 Web MIS Standard area lets you quickly access summary information on the web usage in your network – URL based reports, User based reports, top count of summary for both URL and user based reports. basis which you could decide whether anything was abnormal. Web MIS Exception area contains a range of reports to help you monitor incidents such as a accessing blocked sites, if authentication has failed, restriction reports including IP Based restriction reports.. to help you determine whether you need to tighten or loosen any of your usage policies. PME Mail Usage Statistics Report lets you quickly access summary information on the mail usage, both in count and bytes – local mails sent and received, remote mails sent and received basis which you could decide whether anything was abnormal.